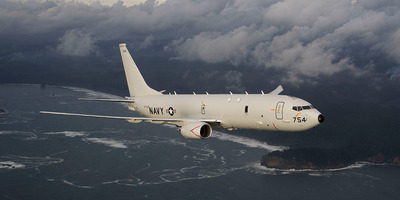 Boeinga US Navy P-8A Poseidon. A Russian defence official said a January drone swarm attack on a Russian military base in Syria had been commanded from a US Navy P-8A Poseidon. A swarm of 13 drones on January 5 and January 6 targeted Hmeymim air base and Tartus Naval Facility, but Russia repelled the attacks, it said at the time. The US’s P-8 can communicate with drones, but Russia provided no evidence to back its claims that the US Navy tried to attack and kill its servicemen in a thwarted strike. Russian Deputy Defence Minister Alexander Fomin said a January drone swarm attack on a Russian military base in Syria had been commanded from a US Navy P-8A Poseideon, Russian media reported. Russia’s Ministry of Defence released photos of fixed-wing, unsophisticated drones that the US doesn’t acknowledge as part of its inventory. Russian President Vladimir Putin’s spokesman, Dmitry Peskov, described the allegation as “very alarming,” Radio Free Europe reported. “Any suggestion that U.S. or coalition forces played a role in an attack on a Russian base is without any basis in fact and is utterly irresponsible,” the Pentagon responded at the time. The Poseidon P-8A does have the capability to communicate with drones, but it’s entirely unclear if it can command a fleet of 13 drones. 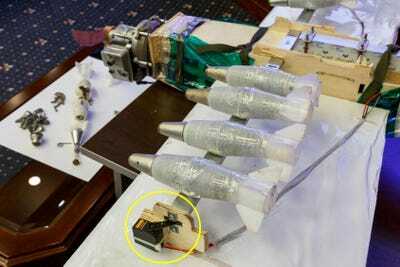 Russia initially displayed the drones after the attack, but did not produce any hard evidence that they communicated with the US Navy. BellingcatImages fo the drones that allegedly took part in the attack. Russia has some of the world’s best air defences around its bases in Syria, which Igor Korotchenko, editor-in-chief of Russia’s National Defence journal, told Russian media contributed to the attack. The US “pursued several goals,” with the alleged attack, said Korotchenko. “There were three such goals: uncovering the Russian air defence system in Syria, carrying out radio-electronic reconnaissance and inflicting actual harm to our servicemen in Syria,” he said. In April, the US would attack targets in Syria suspected of participating in chemical weapons attacks on civilians, but Russian air defences stood down.